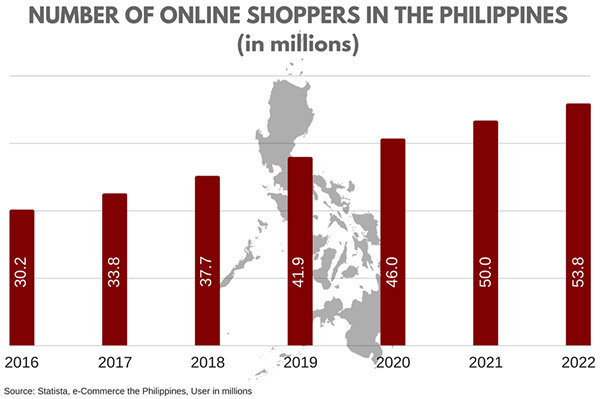 Though e-commerce still represents less than 1% of all sales in the Philippines, the market will grow with high double digits in the coming years. 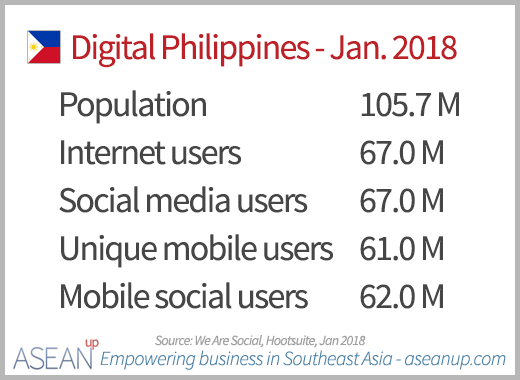 Though not as mature as e-commerce in Malaysia or booming like the Indonesian e-commerce, the Philippine population of more than 100 million still makes the country very attractive. The improving telecommunications infrastructure, the growing proportion of the population with internet connectivity, especially through mobile phones, are some of the key factors that will make the Philippines a major player of e-commerce in Southeast Asia in a very near future. 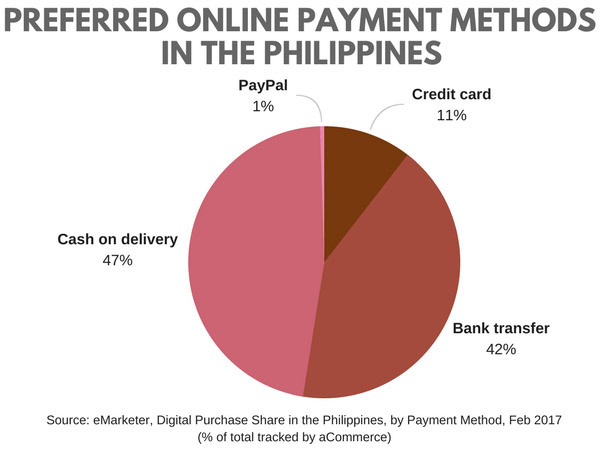 The following graphic regroups the different actors in each category of the Philippine e=e-commerce landscape. 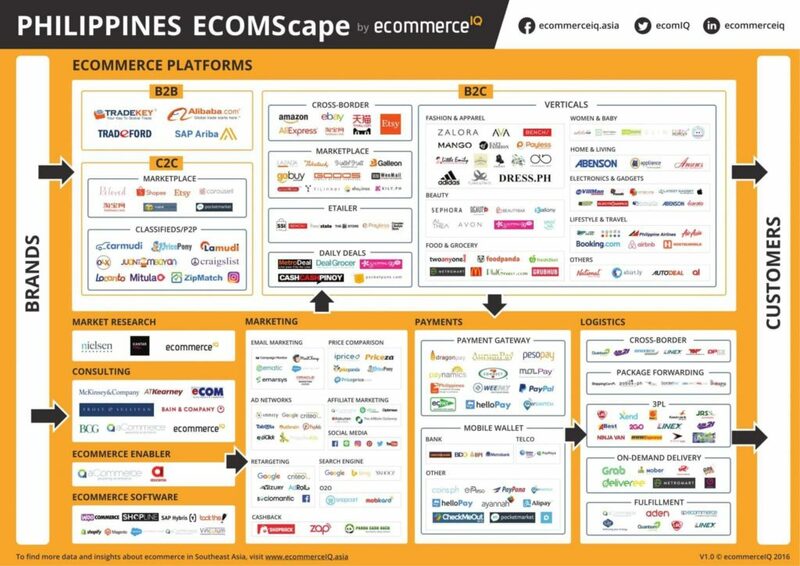 It gathers the most popular e-commerce players, platforms as well as services providers in the Philippine e-commerce market, created by ecommerceiq. For more information of the key players, check the top 10 e-commerce sites in the Philippines 2018, and for official news and government actions for e-commerce in the country, read the e-commerce news from the Department of Trade and Industry of the Philippines. 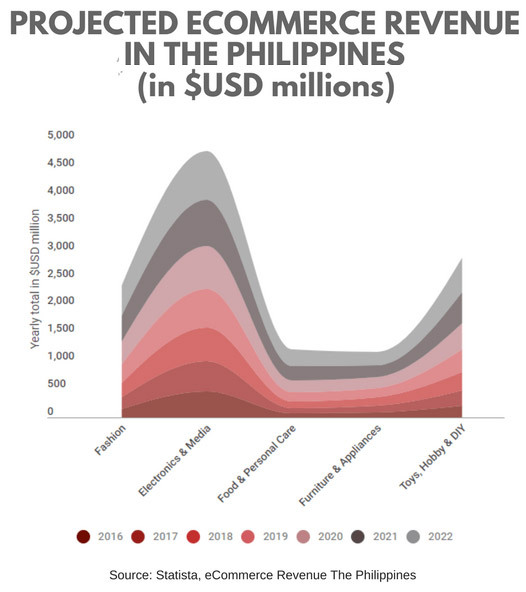 Philippine e-commerce market revenue: US$840m in 2018. Annual growth rate (2018-2022): 12.0%, with an expected market volume of US$1,322m by 2022. Largest segment: Electronics & Media – US$234m in 2018. User penetration: 44.1% in 2018, expected to reach 46.5% by 2022. Going into further details about consumer behaviors for e-commerce in the Philippines, the following graphics derived from eshopworld compile a series of useful numbers, insights and trends in a series about the market: numbers of consumers and evolution, important products categories and evolution, payment methods.